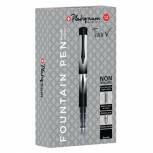 Pilot Black Ink/Metallic Grey Barrel VPen Disposable Fountain Pens (Pack of 12) SV4W-01 Pack of 12 Pilot V Disposable Liquid Ink Fountain Pen. 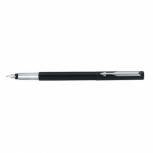 Medium steel nib ensures smooth flowing ink. 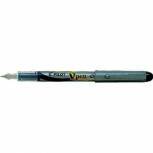 Barrel features a window allowing ink level to be monitored and the pen is fitted with a ventilated cap. Metallic Silver Barrel with Black Ink. Pilot Blue Ink/Metallic Grey Barrel VPen Disposable Fountain Pens (Pack of 12) SVP-4M-03 Pack of 12 Pilot V Disposable Liquid Ink Fountain Pen. Medium steel nib ensures smooth flowing ink. 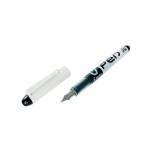 Barrel features a window allowing ink level to be monitored and the pen is fitted with a ventilated cap. Metallic Silver Barrel with Blue Ink. Parker Vector Fountain Blue PenMedium 67507 S0881011 Pack of 1 Parker Vector a versatile modern high function and practically styled fountain pen for both students and professionals. Standard Fountain Pen. Colour - Blue. Parker Vector Fountain Blue PenMedium 67407 S0881041 Pack of 1 Parker Vector a versatile modern high function and practically styled fountain pen for both students and professionals. Standard Fountain Pen. Colour - Black. Supplied with washable royal Blue ink cartridge. 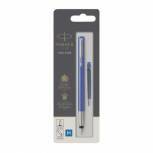 Parker Blue Vector Fountain Pens Standard (Pack of 6) S0881010 Pack of 6 Parker Vector a versatile modern high function and practically styled fountain pen for both students and professionals. Standard Fountain Pen. Colour - Blue.